I’ve noticed that, while I love thick books, I tend to avoid those unless absolutely necessary. So, while I force myself to read the big books, I figured I would make it fun and include you guys too. And so the 350 page books challenge was born. The objective is to read as many books as possible that contain 350 pages. The challenge will last from January 1st, 20110- December 31st, 2011. · *This challenge does not have to only include YA, but it should be predominantly YA that means at least 75% of the books you read should be young adult fiction. · * Each book MUST contain 350 pages or more. · -You can add each book as you read them. You do NOT have to make a list. One randomly picked participant will receive a massive prize pack with BOOKS and ARCs and SWAG! So, if you’re willing to join, please fill out the form below! Good luck! Have fun reading! SIGN UP FOR THIS CHALLENGE IS OVER! all my books are 350 pages or under, i dont like reading long books so this would be a super challenge for me, dont know if ill participate yet or not. but you won an award! Mmm, I'm not sure how many books i have with 350 pages or more. Do I need to make a list in advance or just count each book that I read with 350 pages or more as and when I read it? You can just add each book that you read as you read them. No need to make a list. I'm like you...I tend to avoid longer books. Mostly because I have hard time putting a book down once I start and with shorter books it's easier to put my life on hold. But, I'll give it a try. Thanks for the opportunity to test my (page) limits! 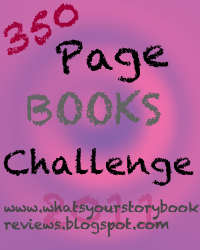 Thanks for visiting my blog and telling me about your book challenge. I haven't done any challenges because after I read all the books I need to review, then I really want time to read what I want. But . . . there are plenty of 350+ page books that I want to read, so I'll think about it! I'm now following you. Love your "dots and stripes" design. This is a perfect challenge for me to join. I feel the same way about super long books. I'll remember to join the challenge soon. I have a few books on my TBR pile's that's definitely > 350 pages long and I've been putting them off because of that. But none of them are YA though. LOL. Still, I'll think about it. awsome challenge :) I joined. Very good challenge. I just joined and I'm a new follower too! Your blog is very cute. Looking forward for this challenge. I love reading huge books. I finished the challenge! Yay! So the participant will be picked by most number read or completely randomly?? I'm excited for this challenge; just joined. Almost all the books I read are about 250 pages, so this will really be pushing myself! Thank you to everyone who has joined so far! This sounds like a really fun challenge to do! I hope it isn't too late to sign up? When I joined this, my blog name/url changed. Just wanted to update: no longer Rebekka's Reading Room. Are you going to post a link up for our results for this challenge?